There are different types of iron solutions. This page is about the type of iron solution called ferric carboxymaltose (Ferinject). 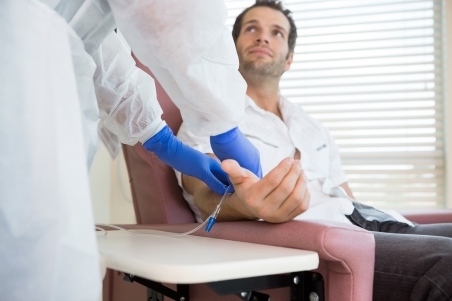 If you're low in iron, your doctor may prescribe intravenous (IV) iron to boost your levels. This means you'll get an iron solution directly into your bloodstream, through a needle that goes into one of your veins. You will receive the iron at a general practice, the Medical Day Unit at Christchurch Hospital, Christchurch Women's Hospital, or Burwood Hospital. Your treatment will take 15 minutes. But you'll have to be there 15 minutes before the treatment, and wait 30 minutes afterwards to make sure you're well after the infusion. have had an iron infusion before. Like all medicines, IV iron can have side effects. Your doctor will talk to you about the possible side effects. Your nurse will monitor you during the infusion to check if you're having any side effects. The most common side effect of IV iron is a headache. Usually this happens soon after having the infusion, and settles if you take paracetamol. Other side effects include feeling dizzy or sick, or staining of your skin around the injection site. There is a very low risk you may have an allergic reaction called anaphylaxis. This can make your face, mouth, and tongue swell and can make it difficult to breathe. It's most likely to happen soon after treatment. This is very rare, but it's a serious reaction and it's why you need to wait for 30 minutes after the infusion to check you have no problems. If you're feeling unwell or think you may be having side effects, either during or after treatment, it's very important to tell the doctor or nurse looking after you. You'll have to wait 30 minutes after your treatment, to make sure you don't have any side effects. If you’re at home and could be having an allergic reaction such as your face or tongue swelling, collapsing or difficulty breathing, phone 111. If you take iron tablets you'll be asked to stop taking them for three months. It can take some time for your iron levels to improve, so your doctor will ask you to have a repeat blood test six to 12 weeks after your treatment. You may need a second treatment if your iron levels are still low.